Platform Builder 6.3 is out. You can view all the updates here. cooldown was added as a new variable in character physics which affects how quickly the character naturally slows down to standing position when the left and right keys are released. seismic pound = light/medium/strong can be used to cause the character or enemy to perform a seismic pound. if standing = true is an example of how you can check the state of the character. All of the conditionals are: standing, walking, running, skidding, full speed, jumping, falling, standing attack, moving attack, jumping attack, hovering, gliding, ducking, defending, defended, pounding, pounded, wall sliding, climbing, hanging, swimming, using pick up gun, [and] using pick up melee. You can read a little more about them here. One important addition is the "delay" command. With this command, you can cause other commands to be delayed, saving you the hassle of creating a timeline to accomplish the same thing. You specify the delay in 1/10th seconds, similar to timeline positions. It looks like this. ]This will cause the health and max health to increase by 1, 3 seconds after the command is run. If you are only delaying one command, the straight brackets are not necessary. As you can see, this looks similar to using if conditionals with or without curly brackets. If you'd rather work in full seconds instead of 10th seconds, you can use "delay 3 seconds" as your command. 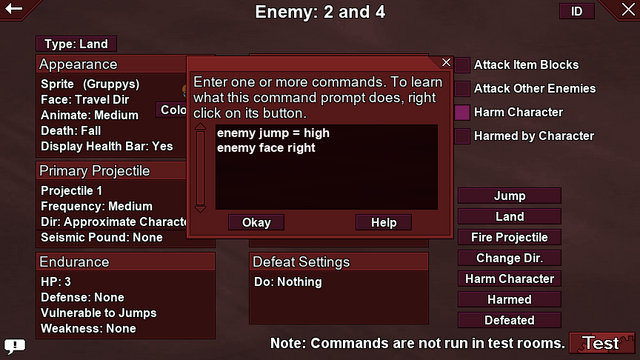 When you use these commands without an enemy ID like this, they will apply only to that 1 specific enemy which is running the command. The command prompt page has also been updated to reflect these changes. This is great! But I wish that you added the command to spawn enemies where the character is. Like, "Spawn enemy (ID)=player 1".